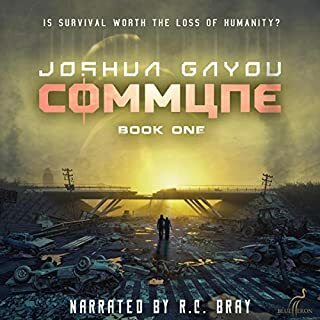 This audiobook includes books 4-6 of Crash Dive, Omnibus. 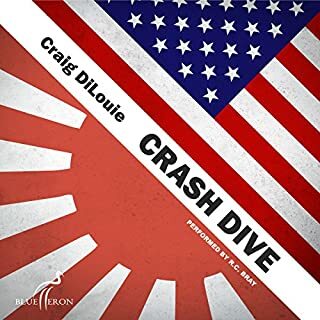 Crash Dive, Book 4 - Contact: Still reeling from the hellish battle in the Japan Sea, Lt. 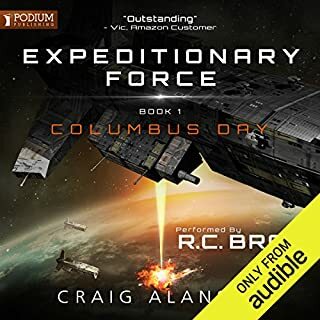 Commander Charlie Harrison returns from Prospective Commanding Officer School to find the Sandtiger languishing in repair while her crew idles. He expects to take command, but the post is given to Captain Howard Saunders. Sandtiger's orders: Take a team of elite commandos to the island of Saipan to destroy a major coastal gun before 70,000 Marines land on its beaches. Once Saipan is taken, American bombers will be able to reach Tokyo. For the Japanese Empire, this triggers kantai kessen - the final decisive naval battle.When disaster strikes, Charlie must save his submarine and salvage the mission, battling his erratic commander while fighting the enemy. Along the way, he learns sacrifice and the true cost of war. 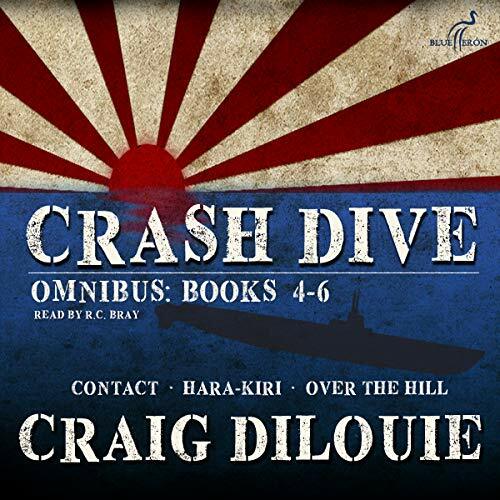 Crash Dive, Book 5 - Hara-Kiri: Charlie Harrison finally achieves his dream of commanding the Sandtiger, leading her able crew on a war patrol to the Philippines in September 1944. Along the way, he faces the challenges of command, a malfunctioning boat, and a patrol area that appears devoid of enemy ships. When a massive fleet materializes on the horizon, he identifies it as Admiral Halsey's Third Fleet. America is invading the Philippines to cut off Japan from its colonial resources. The Japanese Combined Fleet responds, culminating in the Battle of Leyte Gulf and Charlie facing the ultimate test. Crash Dive, Book 6 - Over the Hill: In this final, powerful episode in the popular Crash Dive series, the war to which Lt. Commander Charlie Harrison has sacrificed everything will demand far more. In return, it will teach him war's true meaning and propel him to his destiny, one that is dark and brutal but also filled with hope. I can't say enough as to how powerfully moving the last quarter of book 6 is I laughed and I cried. I recommend this book to anyone with ears or eyes. Fantastic Story! R.C Bray...So Good! Having lived in Hawaii, and been immersed in the history of the pacific campaigns of WWII, I found this entire saga to be absolutely gripping, and fantastic. Must "Read" I couldn't stop listening. Just an epic story; the characters are absolutely genuine and you find yourself drawn to them as they unfold over the series. Charlie Harrison, the central character will make you want to google his name just to see if there is by chance a real person behind the character. It's good story telling, very believable, not overly cliche as can some war stories become. I enjoyed that with each conflict in the story, there's not a repeat of the same narrowing escape duplicated. The final book, in which portions of actual historical events regarding the use of weapons of mass destruction overlap with the story itself, may come off to some as "anti-war political commentary," - though it wasn't verbose in it's presentation, and as someone with a deep love for American Naval history, I didn't see it as out of place, in fact, I think it was well used and made the story that much more believable. War changes people! This can't be missed. I think it was central to the conclusion of the saga! I give the author props for not leaning to far either way, - political correctness vs superhero fantasy with way as the backdrop! I think when you read stories about real events, you should walk away, not with some romantic idea about the events, but a deep appreciation and real interest in the history of the real life "Charlie Harrisons". Characters that became antagonist in the stories are real, amusing, quirky and genuine, not caricatures or Hollywood style villains. I think it should make any reader not only enjoy the emotional connection with the characters, but appreciate the incredible stories of those who fought in this war on both sides. Lastly, R.C Bray! just listen! Amazing story teller! Can't say enough great things about listening to him! No one could tell have read this story better then R.C. Bray! Fantastic series and R. C. Bray makes a good book absolutely spectacular. Would highly recommend. I couldn’t help it. I binge listened to all 6 books in less than a week. R.C. 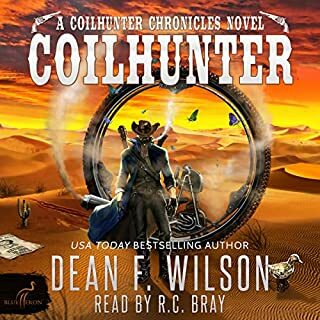 Bray was the PERFECT voice for a whale of a tale about grizzled Navy seamen and the equally rugged officers who led them. 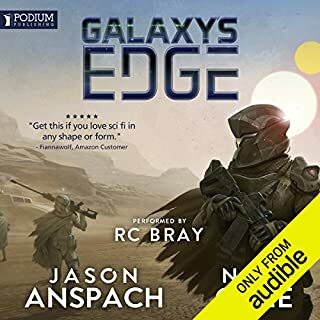 If you like a fast moving adventure story about victory, defeat, love, heartbreak, advanced technology, broken technology and the brotherhood of warfighters, you’re gonna love this series. Loved this novel . The characters and scenarios are so compelling and RC Brays narration is superb. hated to see it end. if you have a military background, this book will resonate. if you aren't one of the characters, you will have certainly served with one or more. this certainly is NOT a waste of time. The Crash Dive series is an outstanding collection of books. Well-written by Craig Delouie, brought to life by RC Bray. Wow! Great series! Highly recommended! A very interesting story with a great narrator! Loved it! "Battlestations! , Torpedo attack! Dive, Dive, Dive!" 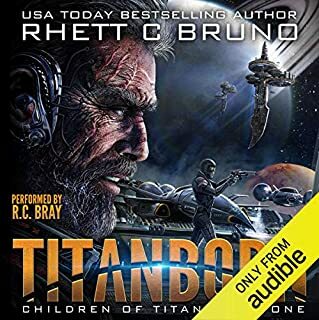 One of the best series of audiobooks I’ve reversed heard. loved it. left wanting more from author and narrator. up scope. down scope. dive dive dive.